A lot has been written about the Lexar BootIt tool to format USB flash drives and flipping the removable media bit. 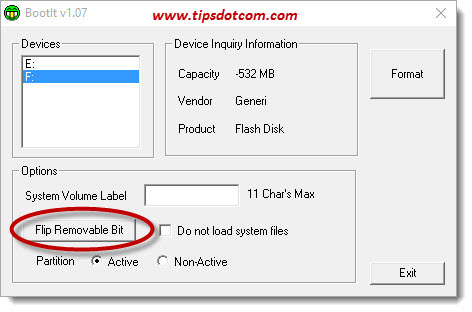 If you search the internet for tips to flip the removable media bit (RMB) in USB drives, you’ll find many good hints and suggestions but unfortunately you’ll also come across a ton of stuff you DON’T need to know. Sifting through all this (mis)information can be a very time consuming and frustrating experience, so I put this little article together offering everything you need right here. The reason WHY you would want to flip the removable bit on your USB flash drive? It depends. Some people want to do this in order to be able to create partitions on their USB thumb drive (which you can’t do on a drive that is considered a removable drive by Windows). Others want to install their Windows operating system on a USB stick and boot the computer from this USB installed operating system. The latter can be a technique to boot a laptop from work on which you don’t have administrator rights into your own Windows environment, without messing with the actual operating system on the hard drive. 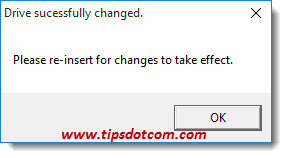 What’s more, this is one of those computer tips and tricks often sought out by people who want to create a “portable” Windows operating system that they can carry around with them on a USB stick. They can plug the USB stick into any computer and boot straight into their own portable Windows environment, complete with their e-mails, documents and other stuff. As you can see, there are several reasons why someone might be interested in the Lexar BootIt tool in order to flip the removable media bit of their USB flash drive. Lexar BootIt tool you say? Yes indeed, even though the tool is brought to the market by Lexar, it will also work on some other brand drives with the same controller. A word of caution is needed though: Even though I recommend to give the Lexar USB format tool (this is the same as the BootIt tool) a try if you’re trying to revive a dead USB flash drive in one of my other articles, THIS CASE IS DIFFERENT. If you’re going to use the USB format tool in an effort to fix a broken USB flash drive, your flash drive is already faulty to begin with. You don’t risk anything if the thing still doesn’t work after using the tool. If it does respond well to the tool on the other hand, your flash drive might get a second life and you may be able to use it for many years after. So you can only win. In this situation though I have to come with a warning message: you risk rendering your USB flash drive useless using the Lexar USB BootIt tool if your flash drive uses another controller than the one for which the tool was written. There are many other brands of USB flash drives that do work with the Lexar BootIt tool, but unfortunately I don’t have a list of manufacturers and types that will work. You can download the Lexar BootIt (also called the Lexar USB format tool) directly from my Lexar download page and save it to your hard drive. In order to demonstrate the benefit of flipping the RMB (removable media bit), take a look at this image showing my current disk situation in my Windows 10 system. The one circled in red is a USB flash drive (brand Fujitsu). 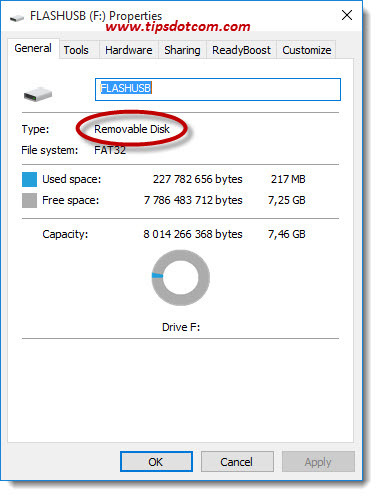 If I open up the properties screen for the flash drive, you can clearly see that Windows 10 recognizes the drive as being removable. That eliminates your chances of creating partitions or installing a bootable Windows operating system on the drive. Using the Lexar BootIt tool however, I can click the button to “Flip Removable Bit”. Simply clicking that button causes the removable media bit to be flipped, there is no need for me to format the drive, so I can even keep the data that’s on the disk if there’s anything on it. (Although if you are going to create partitions or install operating systems on the drive, the data on it will still be destroyed). Immediately I get a notification that the drive is successfully changed, prompting me to re-insert my flash drive for the changes to take effect. Using the Lexar BootIt tool like this has allowed me to flip the removable media bit on my Fujitsu USB flash drive. I hope this helps someone else as well.